Taste of this soup is pleasant. Do not be mistaken that good tonic soup must taste bitter and awful. This tonic soup yields subtle taste. Neither too sweet nor bitter, it has this pleasant Chinese herbal flavour. I cooked this with pig tail which complements the soup pretty well. 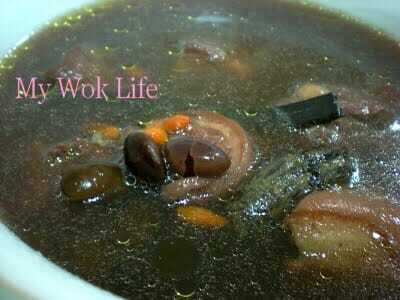 However, you may try to get those skinned tails as the soup might be oily if cooked with skin. Alternatively, use lean pork meat or prime ribs. Add blanched 300grams of pig tails or meaty pork ribs and Chinese herbs into a pot of boiling water. Simmer for 2 hours or longer, with low heat. Add salt to taste when about to heat off, and stir well. Serve hot. You may even choose to boil with slow cooker, like I did. I place all ingredients and normal tap water in the croak pot, and adjust heat button to low (or Auto shift). I had it boiled from morning about 8am till right before serving it in our dinner at about 7.30pm. Thanks for trying.. I guess it should be ok to be taken in general condition. However, it will be best to consult Chinese physician for more tonic soup recipe that helps to strengthen or cure kidney health issues. I did it! :) It was very nice, thanks again.